Today I saw some very simple cards, which were simply elegant in design. 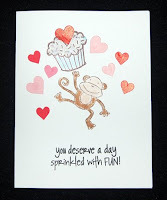 The languages of love stickers and rubber stamp by Stampendous seemed well suited for this type of card. (See the photo. Click to enlarge.) The first card has a heart brad attached to a cut out of the stamped design. The heart is attached with ¼” foam dots. The dots were too thick so in the next card I used 1/8”foam dots. Although the brad was okay, I thought that a rhinestone heart might be more eye-catching. On the second card I also applied a foil sticker (use the Xyron sticker maker) made from wrapping paper punched with the Martha Stewart scallop heart punch. For the third card I decided that a darker card blank would be better. I like the way the foil word sticker looks on the red. (A tweezers can help with application of the sticker.) The final card (my favorite) seems to have the best proportion. As you can tell, sometimes the simple cards are not necessarily the easiest to make because the placement of so few elements becomes critical to the overall design. By tracing the original card, I made a second version from K.and Co. double-sided paper (12x12 book) and a single sided 12x12 sheet from the Smitten collection. The hanger was made from pink beads on a wire. 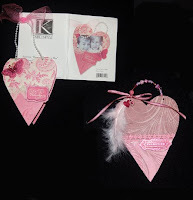 Other embellishments were from K. and Co. Smitten Grand Adhesions and banners, Martha Stewart pink and brown ribbon, and a feather. A piece of pink flower lace was added to the top of the pocket. I made the card a single piece (two cardstock hearts glued together for strength) because I didn’t like the way the back of the original card flapped open. 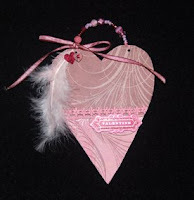 If you want to hang this card on a scrapbook page, make the hanger from ribbon and sequins. Don’t fret if you can’t find the kit; just make a 4”x 5” elongated heart as your pattern. It’s a pleasure to receive fan mail! Thank you so much to Kay Shintani for her compliments about our Hilo store and Craft Newsletter. Knowing that our work is appreciated makes it all worthwhile. You make my free time lots of fun. I’m awfully fond of you! Besides the heart confetti, the Martha Stewart line has a delightful scallop heart punch, heart shaped box kits, and a Valentine ribbon set. These should pair up well with the Stampendous rubber stamps I bought (Bee Buddies, Heart Languages, and Music of Love). I’ll show you what evolves from these sweetheart supplies. Color Me Brown for Valentine's Day? While looking for the new Martha Stewart items (when are they coming? ), I found cute Valentine stuff from Wilton (cake pans, cupcake liners, sprinkles, etc. ), Sanrio (stickers, containers, and more) and novelty items like Chinese take-out boxes decorated with candy hearts. Also at the Hilo Ben Franklin Crafts, I was thrilled to discover a 50% off sale on certain gemstone strands. From the table piled high with beads, I purchased some luscious bargains including some faceted green amethyst, blue opal, garnets, citrines, moonstones, etc. Check out the sale if you’re in the area and remember that Craft Club Members get an additional 10% off. Please also take a look at this month’s project, the Glass Heart Pendant. Give it a try. It’s easy and sure to please your Valentine sweetheart! Whoa! There’s so much to put away and organize. I found homes for most of my holiday craft supplies, but I really need to label bins and boxes better so that I don’t have to open several before I find the right one. Before I get going with Valentine’s projects, I wanted to show you just two of the bookmarks I made with leftover ribbon scraps from Christmas. I mentioned a few blogs ago that I was making a bunch of them to use as tags since I was planning to give books next year. The one with the candy ends are were made by tying knots on the ribbon ends and gluing them to fake peppermint candies. A message can be written on the candy or a removable paper tag could be attached to the ribbon. (Click on photos to enlarge.) 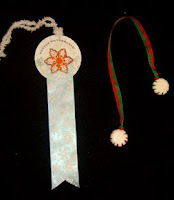 The snowflake bookmark was made from a scrap of Martha Stewart wide satin ribbon and a punch out tag from My Mind’s Eye. The copper snowflake was punched out from a candy box….yes, it pays to save anything which might be usable. If you don’t use something you saved to recycle, you can always throw it away. I find that I usually do use the scraps because I leave them in an open box in plain sight so my mind can figure something out. It’s sort of a challenge, like a puzzle. I’m anxiously looking forward to the Valentine and spring Martha Stewart items, which should be in the store soon. In the meantime I’ll try to finish my holiday scrapbook pages and get to work on two birthday gifts and cards. 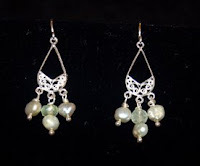 Oh, the other photos are of a jewelry set I recently made. I think the pieces turned out well and because I used chains and wire linked small gemstones, the whole set was rather inexpensive despite the large pendant. (Click on photos to enlarge.) The pendant was not terribly expensive because, although it was a real green garnet, it had lots of inclusions. I think that gemstones with flaws are more interesting than perfect ones, which look like glass to me. I hope that you are finding the time to craft for yourself and others. Ah, it’s the start of a new year with the promise of so many great crafting projects. Although I am still putting away the Christmas supplies and finishing up scrapbook pages, I’m already looking toward Valentine’s Day, Easter, and Mother’s Day projects. A great assortment of Valentine paper and embellishments by K and Co. are already at Ben Franklin Crafts and they seem to be moving fast. I’m always amazed at how the various companies can keep coming up with such beautiful products. Just before New Year’s Eve I decided I needed some black and white jewelry to go with the outfit I was planning to wear to a party. 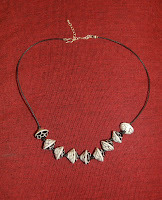 Lacking a lot of time I decided to make a simple necklace of nine black and white ceramic beads on a leather cord. It took less than ½ hr. to put it together. (See the photo. Click on photo to enlarge.) If you decide to make a necklace like this one, be sure that the holes of your beads are big enough to accommodate the leather cord. Also check that the cord fits through the tube of the clasp, and then to attach the clasp put a drop of jewelry glue on the end of the cord and crimp the clasp. My necklace had knots between the beads and a sterling silver extension chain. I like putting extension chains on my necklaces because it allows me to adjust the necklace to suit the neckline of my outfit. 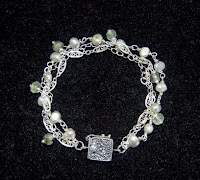 After making the necklace, I had one ceramic bead left so I decided to incorporate it into a bracelet. I like the current trend of large silver circle links and chains so I mixed in some black and white beads along with a Japanese character charm. The result was an eclectic bracelet that matched not only my necklace but also the black and white Asian print of my outfit. It was a fine crafting start to 2008. Hopefully, if folklore is correct, it means that I will be crafting all year!